Alabama running back Najee Harris is expected to miss the rest of fall camp due to a foot injury. Harris was hurt during the team's scrimmage on Saturday and will likely be sidelined for at least two weeks, Al.com reported, citing sources. One of the nation's top running backs in the Class of 2017, Harris is expected to be available for defending national champion Alabama's season-opening clash versus Louisville on Sept. 1. 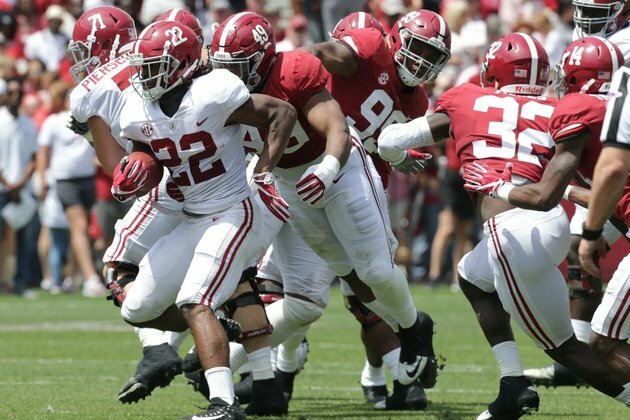 Harris had a disappointing freshman season for the Crimson Tide, rushing for 370 yards and three touchdowns on 61 carries in 2017. However, he finished the season on a high note by rushing for 64 yards on six carries, including runs of 16, 35 and 11 yards, in the national title game against Georgia. The 6-foot-2, 227-pound Harris, who told the San Francisco Chronicle last month that he considered transferring after his freshman year, has been running behind senior Damien Harris since spring practice.